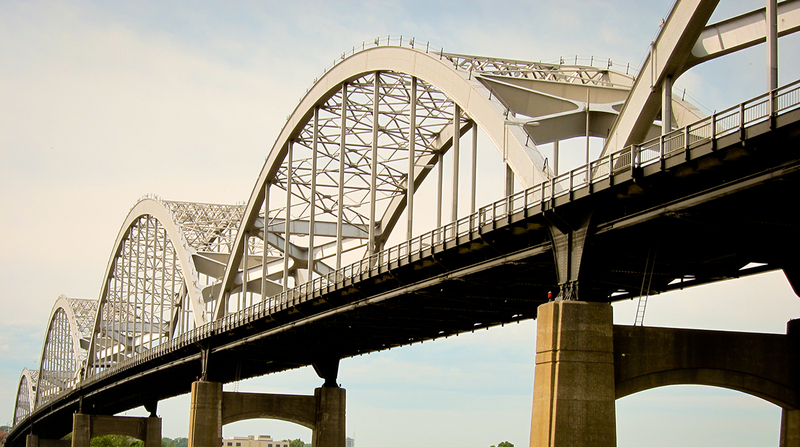 Iowa is home to the most structurally deficient bridges, while the District of Columbia contains the fewest, according to a recent report from the American Road and Transportation Builders Association. Bridges are assessed on a scale of zero to nine, with nine indicating the bridge is in excellent condition. A bridge earns a “structurally deficient” classification if the rating on a key structural element scores a four or below. “While these bridges may not be imminently unsafe, they are in need of attention,” ARTBA’s analysis states. In Iowa, ARTBA found, of the 24,215 bridges some 5,067, or 20.9%, are classified as structurally deficient. The majority of those bridges carry a very low volume of traffic — less than 50 vehicles a day on those deficient bridges. According to Scott Neubauer, bridge maintenance engineer for the Iowa Department of Transportation, most of these bridges traverse small streams. He said that, with their limited budgets, sparse populations and high number of bridges, counties make the best judgments they can when repairing the spans. In addition to Iowa, Pennsylvania, Oklahoma, Missouri, Illinois, Nebraska, Kansas, Mississippi, North Carolina and New York have the most structurally deficient bridges. ARTBA found that other than the District of Columbia, Nevada, Delaware, Hawaii and Utah have the fewest. At least 15% of the bridges in six states — Rhode Island, Iowa, West Virginia, South Dakota, Pennsylvania and Nebraska — fall into the structurally deficient category. The group drew its findings from the U.S. Department of Transportation’s recently released National Bridge Inventory database. Cars, trucks and buses cross the nation’s 54,000 structurally deficient bridges 174 million times a day. The report reveals that deficiencies plague bridges on U.S. routes and interstate highways. One in three, or 226,000, U.S. bridges need repairs. As for interstate highway bridges, one in three — or 17,000 — also are in need. The average age of a structurally deficient bridge is 67 years, and the pace of repairs for these bridges has grown sluggish, ARTBA reports. According to Alison Premo Black, ARTBA’s chief economist, it would take 37 years to remedy all of the bridges. Black identified traffic bottlenecks, which cost the trucking industry $60 billion a year in lost time and fuel, as another infrastructure issue that needs to be addressed. “An infrastructure package aimed at modernizing the interstate system would have both short- and long-term positive effects on the U.S. economy,” Black said. President Donald Trump mentioned his long-awaited infrastructure package in his State of the Union address Jan. 30. He called on Congress to create a bill that generates $1.5 trillion for infrastructure investment though details were slim. Federal dollars will be complemented with state funds, which will be fueled by private-sector partnerships, according to Trump.